St. John’s Catholic Church at Creighton University welcomes parishioners from throughout the Greater Omaha area who embrace and celebrate its Jesuit identity and values such as cura personalis (care of the person). Through inspiring liturgies and homilies that challenge members to “change God’s world for the good” by becoming “women and men for and with others,” the St. John’s community reaches out to serve those in need wherever they may be. Sunday breakfast at our Lady of the Sioux Parish on the Pine Ridge Reservation. The Social Justice Committee provides St. Johns parishioners ongoing opportunities to join together to study, teach, and advocate on behalf of Catholic Social Teaching. 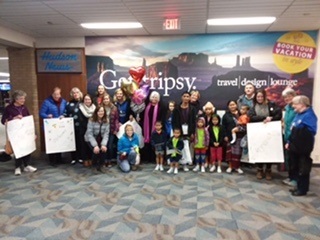 In February we welcomed our refugee family into Omaha. Ministry of the Sick & Homebound is a way of reaching out to our parishioners who are home bound or desiring hospital visits. The Sister-to-Sister India Committee works to build the relationship of St. John's with Mater Dei Parish in the Kohima area of the North East States in India. Human Needs Ministry serves those in need in our parish and surrounding community.